The shooting of Palestinian activist, Ibrahim Abu Thurayya, is a war crime, which has left the two-state solution once favoured by the UN in tatters, writes Ian Curr. Who killed Abu Thurayya, why did he die, and who is guilty? Who knows closing Gaza wins elections. But building settlements is what we said. A legless man had no right to wave a Palestinian flag. It is just too bad that the young fisherman died. So you can't blame me now he's dead. FROM A DISTANCE of only 30 metres, an Israeli sniper shot Ibrahim Abu Thurayya, 29, in the head as he waved his Palestinian flag in protest against U.S. President Donald Trump’s recognition of Jerusalem as the capital of Israel. 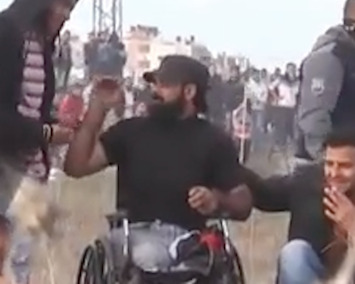 Tributes to Abu Thurayya – who was wheelchair-ridden after losing both his legs during Israel’s offensive on the Gaza Strip in 2008 – popped up across social media. The shooting of Ibrahim Abu Thurayya is a war crime. On Tuesday, 19 Dec 2017, only days after the assassination, several Israeli bulldozers entered the “buffer zone” along the border with the central Gaza Strip, where they levelled lands under heavy military protection. Locals told Ma’an News that four Israeli D9 bulldozers entered into eastern Deir al-Balah in central Gaza, from the nearby Kissufim military site and flattened lands in the area. Israeli military drones were reportedly flying overhead during the incursion. Israeli military strikes inside the besieged Gaza Strip and near the “buffer zone", which lies on both land and sea sides of Gaza, have long been a near-daily occurrence. The Israeli army regularly detains and opens fire on unarmed Palestinian fishermen, shepherds and farmers along the border areas if they approach the buffer zone. Israeli authorities have not clearly defined the precise area of the designated zone. The practice has, in effect, destroyed much of the agricultural and fishing sector of the blockaded coastal enclave, which has been under an Israeli air, land, and sea blockade for ten years. U.N. reports say Gaza will the uninhabitable by 2020. Israeli authorities claim there was a riot at the time Ibrahim Abu Thurayya was shot. Soldiers with unfettered rights to kill is a hallmark of fascism. Their job is to defend the people from violence, not to shoot unarmed defenceless people like Ibrahim Abu Thurayya. Israeli soldiers attack even medical staff to prevent them from saving victims. In the 20th Century, Lord Balfour and the United Nations denied Arab nationalism in favour of Jewish nationalism. 100 years after the Balfour Declaration giving Zionism a home in Palestine and 70 years after the recognition of Israel, the United Nations has voted against U.S. recognition of Jerusalem as the capital of Israel. Is this a vote in favour of Palestinian self-determination? The settler states, Israel and the U.S., opposed the resolution along with few other countries. Others abstained – including Australia – which is effectively a vote for Trump’s shift to the right. 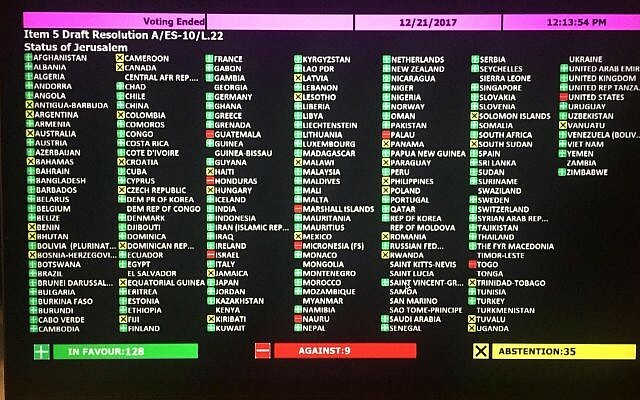 Even the UK voted against the U.S. and Israel. After all, there is still some residual British resentment at being driven out of Jerusalem. Israeli terrorists bombed their embassy at the King David Hotel in Jerusalem in 1946, killing 93 people — many of them, British. A two-state solution once favoured by the U.N. lies in tatters. There can be no such lasting thing as East and West Jerusalem, just as there was no such lasting thing as East and West Berlin — people proved that. There can’t be two states — one (Israel) has all the power including total control over the occupied territories in Palestine. But change is coming as UN voting (above) shows. Why is the position of the embassy important? The aim of some Israeli hardliners is to "Judaise" the Palestinian parts of the Old City — to get as many Jewish families as possible into houses currently occupied by Palestinians. By doing this, they can improve the "demographic balance" of the Old City. There are powerful groups behind this Judaisation, such as Ateret Cohanim, whose funding comes from Jewish groups in countries, such as Australia and the United States. Ateret Cohanim operates in the shadows and is run by an Australian, Daniel Luria. It works to create a Jewish majority in the Old City, as well as in East Jerusalem. You can follow Ian Curr on Twitter @WorkersBushTele.